TALK CLEAN TO ME: The Dissenter & Father of Hand Hygiene Ignaz Semmelweiss turns 195! 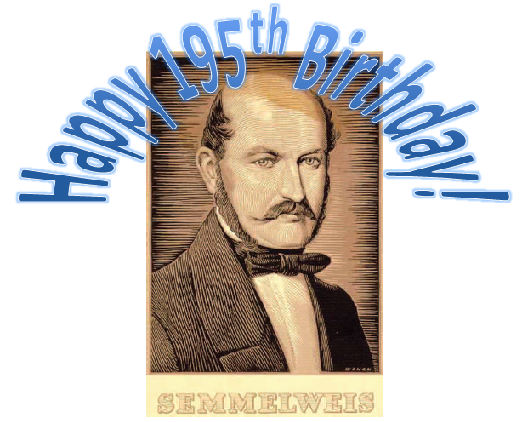 The Dissenter & Father of Hand Hygiene Ignaz Semmelweiss turns 195! It's true, I'm not always known to be a conformist. I can be difficult and occasionally disagree in matters of opinion (the definition of a dissenter). The next time someone comments about my lack of conformity, I'll quote Professor Cass Sunstein from the University of Chicago "Dissenters benefit others while conformists benefit themselves." Semmelweiss was the quintessential dissenter. He challenged the conformists' accepted wisdom and sought answers to problems that, in his mind, had not be suitably explained. But for challenging the norm, he was ostracized, condemned, and driven to a state of near insanity that led to an early death. July 1st marked what would have been Ignaz Semmelweiss' 195th birthday. His legacy of positive dissent, benefited patients not just in his lifetime, but has been essential to patient safety ever since. It seems fitting to pay homage to the man who, through his "difficult" manner and positive dissent from accepted wisdom in the introduction of antiseptic hand hygiene, has saved the lives of millions of patients. The General Hospital of Vienna boasted quite favorable conditions for its time. Unlike its contemporaries of the early part of the 19th century who often had 3 or 4 patients/bed, the General Hospital of Vienna's policy was 1 patient/bed. They further segregated patient care by class: a section for the wealthy, a section for patients who were able to pay a small sum for care and a third section and certainly the largest for those who were unable to pay. The indigent patients were permitted free care with the understanding that some of that care would be seen to by medical students and midwives in training. In the indigent section of the hospital there were two maternity clinics that admitted patients to one or the other on alternate days. One clinic was largely for training of midwives while the second was for training of doctors. When Semmelweiss was appointed assistant to the Professor of the First Obstetrical Clinic some of his first observations were of women desperately weeping and begging to be admitted to the Second Obstetrical Clinic rather than the First and for a very good reason, the First clinic had a deadly reputation. In the First Clinic, maternal mortality rates due to Childbed Fever (a form of septicemia) rarely dipped below 10% of admissions and in some months climbed as high as 30%. Conversely, in the Second Clinic where the midwives were in training, the mortality rate rarely climbed above 2%. Physicians and governmental authorities were more than aware of the ravages of Childbed Fever to the point that they were often referred to as "houses of death", but causes were most often attributed to miasmas (foul air), improper diet, strong liquors or violent mental emotions. Haunted by the higher rates of Childbed Fever in the First Clinic, Semmelweiss was unwilling to accept the conformist view. The only difference between the two clinics were the people working there. After eliminating all factor that were consistent between the two clinics he eventually concluded that the medical students were carrying "cadaverous particles" (e.g. microbes) on their person to the First Clinic after performing autopsies of patients who had died from Childbed Fever. When his best friend and fellow physician died after being cut by a student during an autopsy he was compelled to act. He was convinced the cause of transmission was from contaminated hands of physicians and students. Semmelweiss demanded that all students and physicians clean their hands with a chlorinated lye solution before attending patients in the First Clinic in order to remove or destroy the invisible cadaverous particles. The strategy worked and deaths attributable to Childbed Fever rapidly dropped to below that of the Second Clinic where the midwives had always kept their hands clean and did not attend autopsies. Unfortunately, rather than celebrations and change in practice the culture of conformity triumphed and Semmelweiss was forced to resign his position and subsequently the mortality rates in the First Clinic returned to pre-intervention levels. As we know, Semmelweiss' ideas were eventually accepted and he has become widely recognized as the "Father of Hand Hygiene". In celebration of his 195th birthday, I hope the next time you sing "Happy Birthday" while washing your hands, you'll remember Ignaz Semmelweiss!